Steele, Robert. “Augmented Human Intelligence with Man-Machine Integrity: Future-Oriented Hybrid Governance Integrating Holistic Analytics, True Cost Economics, and Open Source Everything Engineering,” in Daniel Araya (ed. ), Augmented Intelligence: Smart Systems and the Future of Work and Learning, Bern, CH: Peter Lang Publishing, forthcoming. Steele, Robert with Ryan King. 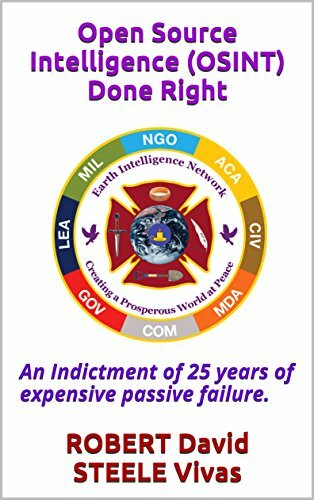 “The Global Brain Storm – Interview with Robert Steele on Collective Intelligence & Global Change,” Phi Beta Iota Public Intelligence Blog, July 9, 2016. Steele, Robert. “EU Rejects Idea of a European Secret Service – Right Decision, Wrong Question, Missed Opportunity,” Defence and Intelligence Norway, June 26, 2016. Steele, Robert. “An Open Letter to All European Ministers,” Defence and Intelligence Norway, June 2, 2016. Steele, Robert. “Open Source Governance: Creating a Prosperous World at Peace,” Open Source Observatory (European Union), May 23, 2016. Steele, Robert. “Proposal for a Nordic Interagency Intelligence conference and centre,” Defence and Intelligence Norway, May 12, 2016. Steele, Robert. 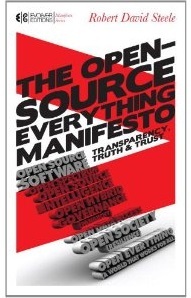 “Open Source Everything Engineering (OSEE) — a Nordic Manifesto,” Phi Beta Iota Public Intelligence Blog, April 15, 2016. Steele, Robert. “Open Source Everything Engineering (OSEE) – Creating the Academy, Economy, Government, and Society of the Future,” Phi Beta Iota Public Intelligence Blog, April 5, 2016. Steele, Robert. “Advanced Scale Computing: Probably Not in Our Lifetime…Unless we embrace Open Source Everything Engineering (OSEE).,” Phi Beta Iota Public Intelligence Blog, March 9, 2016. Steele, Robert. “Human Intelligence and Open Source Technologies,” SingularityWeblog, February 1, 2016. This entry was posted in Open Source on 2016-10-03 by Editor.